If you want to be stronger, faster or have better workouts, you might be considering a dietary supplement such as BSN Nitrix 2.0 to help push you toward your goals. According to the product description, BSN Nitrix 2.0 improves muscle performance, endurance and recovery. Though you should take the supplement as directed by the manufacturer, first discuss the use of BSN Nitrix 2.0 with your doctor before adding it to your routine. BSN Nitrix 2.0 is a tablet that you take before and after your workout, according to the product description. The product directions suggest taking 3 tablets one hour before your workout and three more following your workout. You shouldn't take more than six tablets a day, according to the manufacturer. The tablets should be kept in a cool, dark place and not in direct sunlight. It's also recommended you keep the supplement out of reach of children and pets. When you're taking a dietary supplement, it's important to know what's in it. BSN Nitrix 2.0 contains a number of ingredients, both active and inactive. The ingredients include niacin, citrulline, red pepper extract, hawthorn extract, pterostilbene, pomegranate fruit, grape seed extract, trans-resveratrol, black pepper extract and creatine. Because several of the ingredients are combined in proprietary blends, it's difficult to know how much of each ingredient you're getting. The inactive ingredients act as fillers, coloring and help maintain shelf-life. They also include stearic acid, magnesium stearate, silicon dioxide, microcrystalline cellulose, croscarmellose sodium, titanium dioxide and red, yellow and blue dye. Although the supplement doesn't contain any allergens, the manufacturer warns that the tablets are processed on machines that were exposed to tree nuts, peanuts, soy, milk, eggs, shellfish and fish. 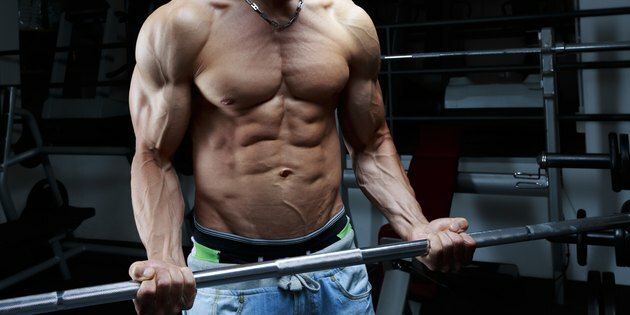 Citrulline is a non-essential amino acid that may increase the amount of nitric oxide in some people's blood. Nitric oxide helps your blood vessels relax, allowing for better blood flow. When taken as a supplement, the amino acid may help lessen muscle fatigue and improve recovery for both cardiovascular and strength-training activities. The amino acid helped a group of cyclists improve their times and post-exercise recovery in a 2015 study published in the Journal of the International Society of Sports Nutrition. Supplementation also decreased feelings of exertion and improved overall performance in a group of weight-lifting women in another 2015 study published in the European Journal of Nutrition. The fruit extracts and herbal supplements in BSN Nitrix 2.0 are rich in antioxidants, which are substances that help protect cells against free radical damage. Although exercise may increase your body's production of substances that damage cells, it's not certain that supplementing with antioxidants offers additional benefits, according to a 2011 study published in Sports Medicine, and more research is recommended. Creatine is a chemical that helps muscles make energy and is taken as a supplement to improve athletic performance. It seems to work best for people doing high-intensity activities of short duration, such as lifting weights. Niacin is a B-vitamin that helps convert food into energy, improve blood circulation and may help reduce inflammation. Though some of the ingredients in BSN Nitrix 2.0 may offer benefits to your workout, dietary supplements aren't regulated like food and medication. Manufacturers don't have to prove their supplements are safe or that they work, according to the Academy of Nutrition and Dietetics. You shouldn't take this product if you're under 18, pregnant, nursing or have a chronic medical condition such as diabetes or kidney disease, or taking any medications. You should also be cautious if you're sensitive to niacin. High doses of niacin can cause burning and tingling in the face and chest. If you take any prescriptions or over-the-counter medications, check with your doctor before taking BSN Nitrix 2.0 because of the potential for interactions between your medicines and the supplement. Medicine and Sport Science: Arginine and Citrulline Supplementation in Sports and Exercise: Ergogenic Nutrients?